Relax and unwind during Labor Day weekend in Las Vegas. Enjoy the ultimate in club crawls, or choose to keep cool with a pool crawl through some of Las Vegas’ unique hotel pools. Whether you party during the day or after the sun sets, you’re sure to have an exhilarating time. TBA please check our website (www.laepiclasvegas.com) to view the lineup for bot pool and club crawls. 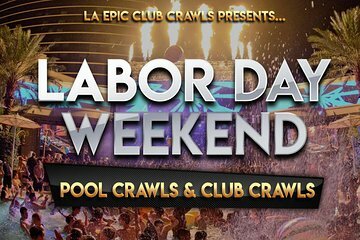 Pool Crawls start at 11:00 AM with a strict 12:00 PM checkin deadline. Club Crawls start at 8:00 PM with a 10:00 PM checkin deadline at the second venue.